Montezuma: A Two-for-One Sale. And an Ill-Advised Handshake. Today Phoenix is the fifth-largest city in the United States—but at the beginning of the twentieth century, it had just 5,000 residents. This tiny population illustrated an ongoing problem for both the Arizona and New Mexico territories—neither one had enough people to be admitted as states. As a result, several proposals were floated to bring the two territories into the Union together as just one state. The 1903 plan proposed that this superstate be named "Montezuma." Democrats in Congress voted in favor of the idea, but they couldn't quite muster enough Republican support. This wasn't the first time the Aztec emperor's name was appropriated. 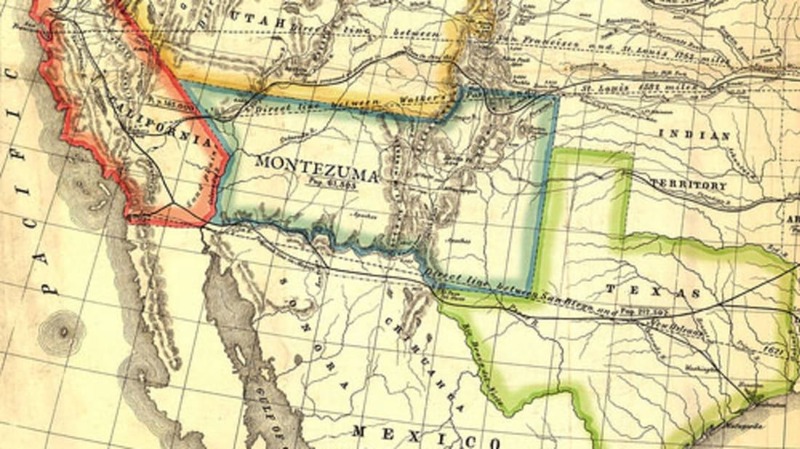 Back in 1887, leaders in New Mexico had proposed switching their territory's name to Montezuma—figuring it would make statehood more palatable to Americans who weren't too fond of any implied association with "old" Mexico. The ploy wasn't successful. They also tried the name "Lincoln" and that didn't work, either. But you've got to admit that any name is better than "New Mexico"—which has to be the worst state name in America. I don't mean any disrespect to Mexico. The problem is that the name is confusing to stupid people. There is clear evidence of this on every New Mexico license plate. The government felt compelled to put "USA" after the state's name, because too many morons thought New Mexico was in, well, Mexico. Speaking of stupidity, I have to mention the sorry tale of Stephen Elkins—the New Mexico Territory delegate to the United States Congress back in 1875. That year, population issues didn't seem to matter to Congress—and the Senate and House were both in favor of New Mexico statehood. But just before the final vote, Elkins entered the House floor and conspicuously shook hands with congressman Julius Burrows of Michigan. Burrows had been extremely critical of southern racial policies—infuriating congressmen from states like Georgia and Alabama. So when the southern delegation saw Burrows fraternizing with Elkins, they immediately switched their votes. It was just enough to kill the statehood bill. One ill-advised handshake meant New Mexico would have to wait 37 more years to join the Union.